The form that a user interfaces with in choosing where a print job should be sent is what Microsoft Windows refers to as a print dialog box. It is not really a box but a small modal form that loads on top of your current screen or form. 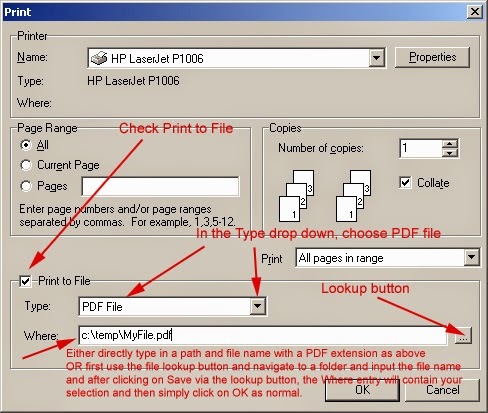 Print dialog boxes server a similar function in different programs, but they can differ greatly in appearance and functionality from one software program or system to another. In Advanced Accounting (or programs written using the TAS Premier development platform), a print dialog box is triggered after a user selects something to print. In Advanced Accounting this is done by either by (1) clicking on the printer icon in a report preview in the upper left hand corner of the screen, or (2) immediately after clicking on a Print button with the print preview unchecked. Either of those two things causes a "print dialog box" form or screen to appear. Normally at this point a user would simply click on OK to print if their default printer name appears in the upper drop down, and after making any other desired selections. What is critical above is to know exactly where you have saved the file so that if you are wanting to attach it to an e-mail, you will know where to look for it (or if directed to an XLS file type, where to open it from your spreadsheet program).